With workforces moving more and more mobile on a daily basis, it is essential to ensure that your company is able to arm your employees with the analytics that they need to succeed. 89% of business leaders believe that Big Data will revolutionize business operations in the same way that the internet did. These numbers show the trend towards investing in a BI system. 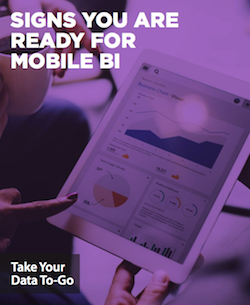 So if you are looking to stay on the front foot and ensure success for your business, download and read our latest guide Signs you are Ready for Mobile BI.